Online shopping during the holiday season is growing by leaps and bounds as consumers search both for unique gifts and price drops that they might not necessarily be able to find in their local stores. Today, CouponBuzz.com is featuring an HP Black Friday coupon code for $150 dollars off the HP Envy Ultrabook 4t at the top of their webpage dedicated to hosting special offers and coupon codes from HP. The number of consumers expected to visit the site and utilize this coupon code in their online shopping is higher than ever. On November 27th, 2011, the Associated Press quoted the research firm comScore’s report that online shopping in 2011 was 26% higher on Black Friday than it had been in 2010. Consumers determined to avoid the Black Friday crowds poured about $816 million dollars into the coffers of online merchants, $168 million more than 2010. And online sales for the 2012 Black Friday shopping weekend are expected to jump even higher. The HP Black Friday deal for the HP Envy Ultrabook 4t offers a $150 dollar discount on an impressive computing machine. It weighs in at under 4 pounds, and has a sleek compact design that is just .78 inches thin. The HP Envy Ultrabook also comes standard with a second generation Intel Core i3 processor, 4 GB of DDR3 memory, and a 500 GB hard drive. All of which are upgradeable even further through consumer customization online. In addition, it boasts a satisfactory 7 hour battery life that will carry users through the day. 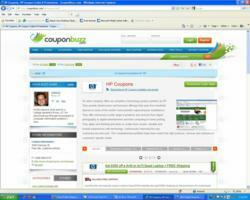 Online shoppers can access this HP Black Friday deal via CouponBuzz.com’s dedicated webpage for HP coupons, located here http://couponbuzz.com/hp-coupons.html.